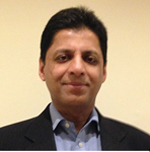 Dr. Mathew is the clinical lead for cardiac imaging at Nottingham University Hospitals and specialises in echocardiography, cardiovascular magnetic resonance imaging and nuclear cardiology. He is also the training program director for East Midlands North Deanery and a member of the BCS training committee. Dr. Mathew is an elected council member of the British Society of Echocardiography and a member of the BSE educational committee and an editorial board member of the British Journal of Echocardiography. Dr. Mathew was trained in cardiology at The Royal Victoria Hospital, Belfast and gained further experience in cardiac imaging from Wales Heart Research Institute and Royal Brompton Hospital, London. He has over 15 years of experience in cardiovascular imaging and his interests include non-invasive imaging of ischaemic heart disease, valve assessments and cardiomyopathies. He is passionate about teaching and has vast experience in lecturing and teaching at national and international meetings and courses. He runs several regional and national courses including the core training course for echocardiography and TOE simulation training. He is the co-author of several national guidelines and is the current lead for echo training of specialist registrars.